Spring is here, and with that comes spring cleaning and gardening. It’s the perfect time to get the kids to clean out their toys and unused items (including fun trinkets for this craft! ), and teach them how to plant and care for a garden — maybe even one of their very own. While recently cleaning out my daughter’s closet to bag and donate items, we found an old jewelry box that she no longer used. She’s accumulated a few over the years, and there’s only so many that she can actually put to use, so this one has sat in the back of her closet collecting dust. We decided to turn it into a very fancy fairy garden. We love making fairy gardens in our home; we’ve made them out of wooden chests, vases, pots, and even bowls. All you need is a little imagination, and you can give a once-loved treasure new life. 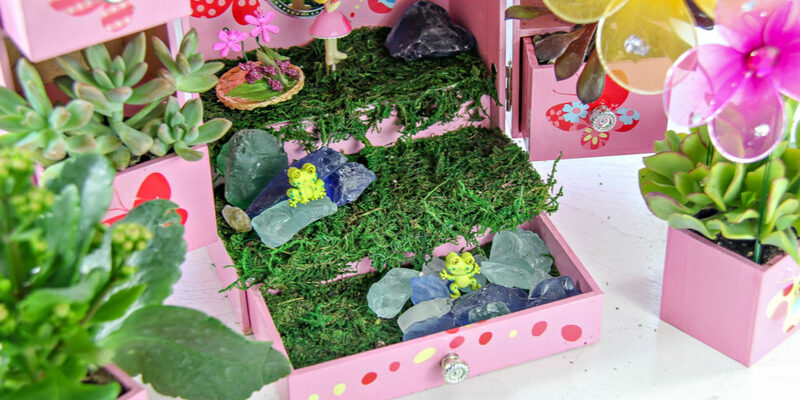 This jewelry box fairy garden is inspired by Fancy Nancy, one of our favorite books. 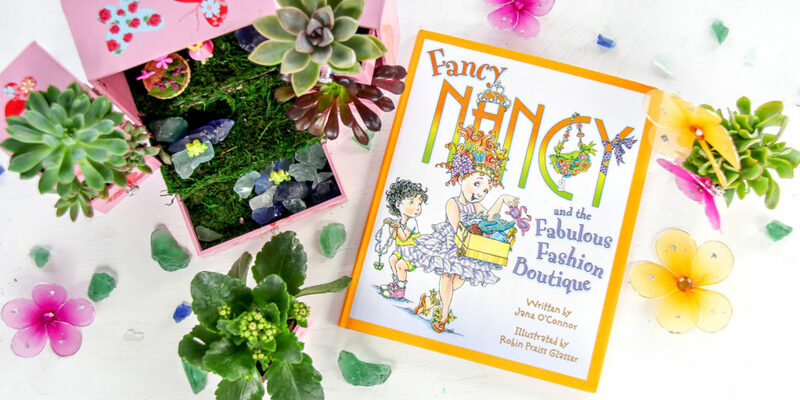 In Fancy Nancy and the Fabulous Fashion Boutique, Nancy is having a yard sale and selling some of her elegant items, but she also wears some pretty fabulous hats while tending to her sale that have butterflies and flowers all over them. 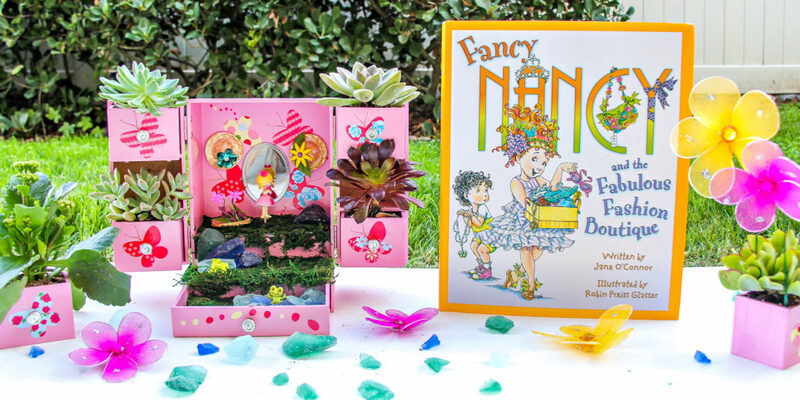 I decided that our very pretty doll in the jewelry box would be très chic with some very fancy “gardening” hats, just like Fancy Nancy, while she’s tending to the garden. And the best part is this jewelry box still plays music, so while our charming doll is tending to her fancy fairy garden, she can enjoy a little musique. 1. 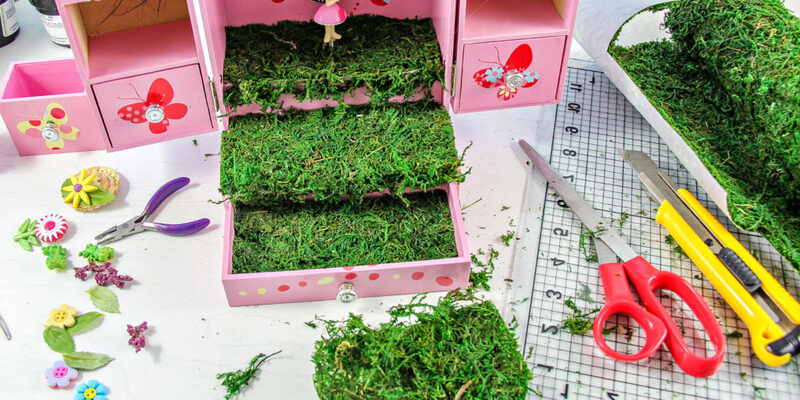 Cut sections of a sheet of green moss (which you’ll be able to find at a craft store) and line the shelves, and drawers with it, using hot glue to stick it down. 2. Plant the succulents into drawers, putting a few rocks into the drawer first for drainage. Tip: Have your child ‘water’ the succulents weekly by popping an ice-cube into the drawer, this way the plant will get water, but the drawers won’t get soaked through and possibly water-damaged from over watering. 3. Decorate the straw hats with buttons, silk flowers, leaves, and anything else you can think of. The fancier the better. Use hot glue to attach items to the hat. 4, Add trinkets — such as decorative rocks, butterflies, flowers, and like I did here, frog buttons — to your garden. This is your child’s chance to get a little wild and add fun things they find in their drawers and around their bedrooms. And wa-la! 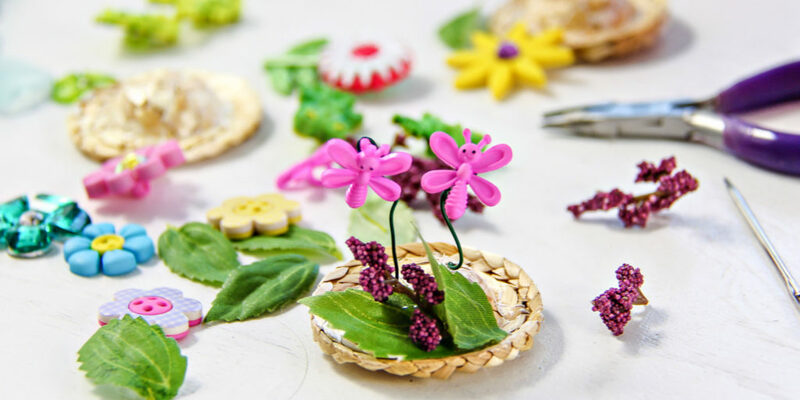 You’ve got yourself a beautiful fairy garden! 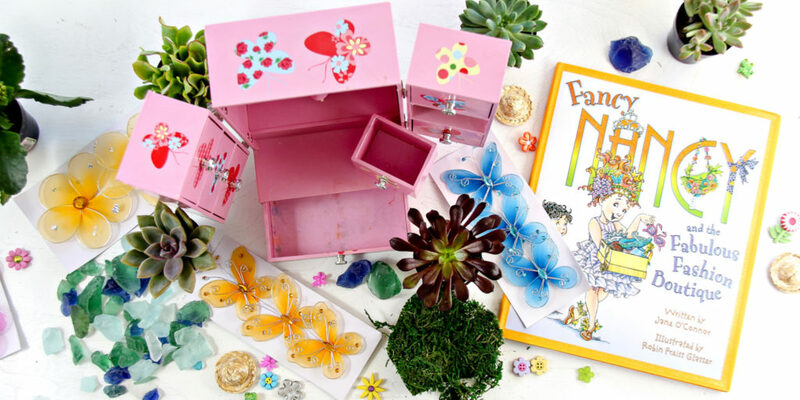 This is the perfect spring activity for kids, teaching them how they can turn unused items into a new treasure, tending to their own garden, and it makes a fabulous story-time activity, too. 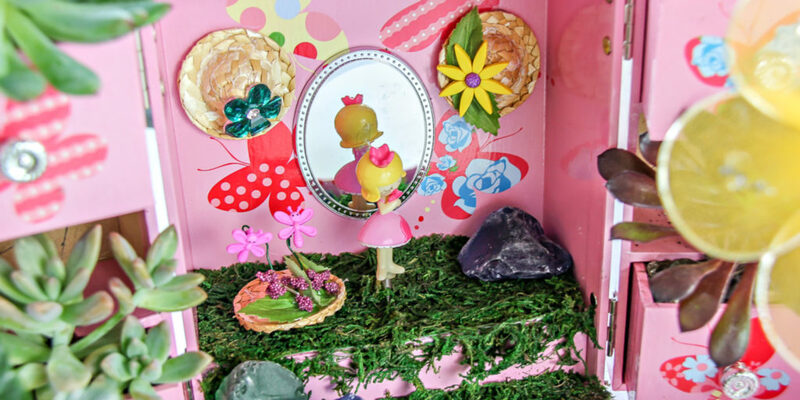 This entry was posted in Birthday Party Ideas and tagged DIY, Fairy Garden, fancy nancy. Bookmark the permalink.